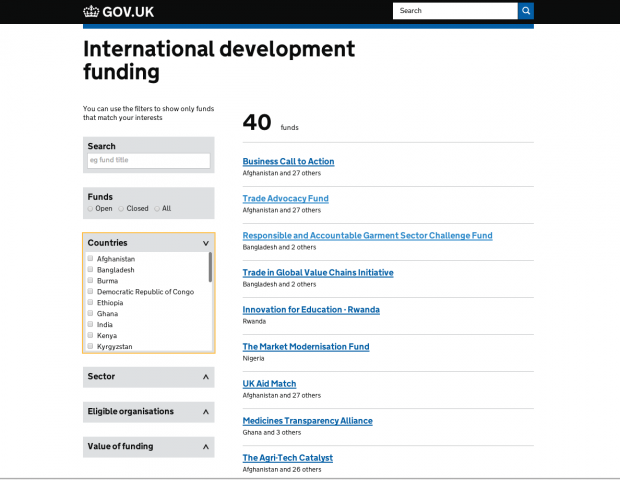 Today we’re launching a new finder for international development funding on GOV.UK. The UK spends 0.7% of gross national income on international development, and the majority of this is spent through partner organisations, so it’s essential that they can find relevant funding offered by DFID. The finder tool is designed to make it simpler, clearer and faster for users - NGOs, charities, academics, businesses and individuals - to find out what funds they could apply for. Users can filter by countries, sectors, eligible types of organisations and the value of the funding. 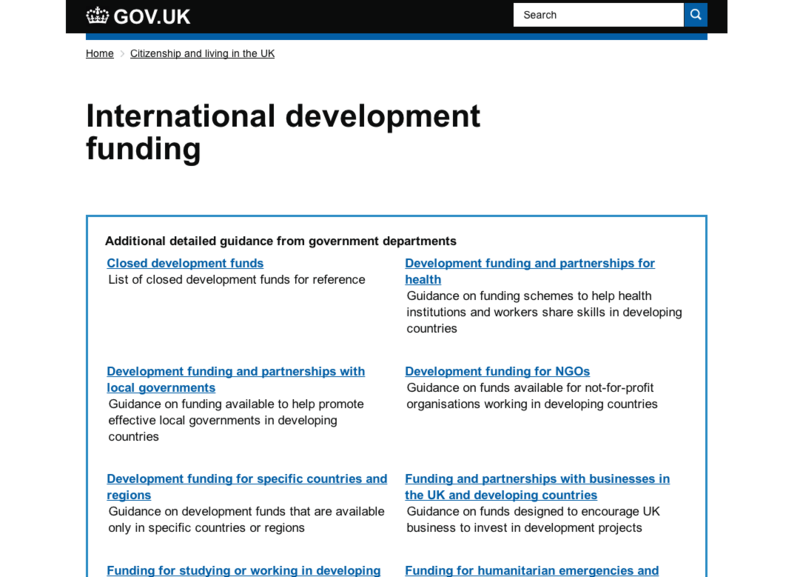 Previously, international development funding opportunities were listed in a detailed guide category, grouped mostly by sector. This made it impossible for users to search across all funds by different criteria, such as which countries the funding can be used for, or the amount of funding offered. Since this is the second finder we’ve built of this kind (the CMA was first) we knew the structure already, but we still had to decide what the right facets were for DFID’s users. We mocked something up based on DFID’s subject matter expertise and then tested this prototype at a meeting of Bond, the UK membership body for organisations working in international development. One of the users from the research told us “I go to the DFID site every day to keep a lookout for funding opportunities in line with our strategy” and they all identified the website as the main way that they knew funding opportunities were available. Their feedback on the tool overall was very positive and we got some useful insights for improving the facets. For example, we learned that the ‘value of funding’ filter didn’t have enough options at the higher end of the scale, so we have now added more. Similarly, in the location filter, regions (eg Africa and Asia) were too general to be useful, so we stripped back to just countries. Now that it’s live we’ll be looking to see how well the funding finder performs through the analytics and we’d be grateful for any feedback!